Super Bowl parties are, rightfully, a part of game day celebrating — but “out of bounds” eating may just score you a couple of unwanted pounds. Professional football players combine all of the elements of physical fitness â€” whole body muscle building from pushing against opponents to cardiovascular challenges from sprinting or running â€” and they burn a load of calories. 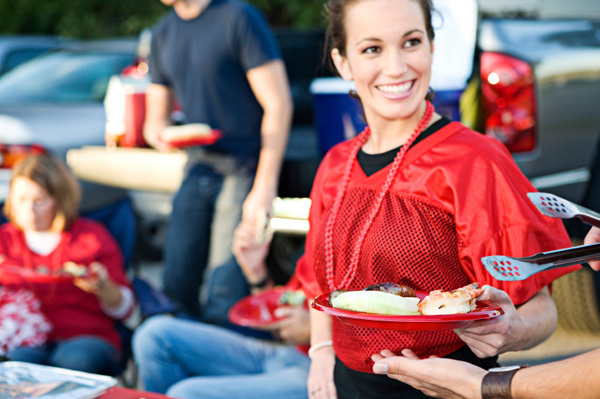 However, spectators remain sedentary throughout a game except to jump up and hurrah or to grab another plate of food. Instead of throwing your diet offsides, approach the big day with a game plan to avoid having your health eating efforts trounced. Once you learn the rules, you won’t have to fret the gain. Here are some offensive and defensive strategies to keep you at your playing weight! Before the first morning play commences, go to the gym or go for a run to kick start your metabolism and burn some calories. You will feel energized and will likely strengthen your will power against the fat and calories awaiting your arrival. Snacks containing a combination of protein, carbohydrate and fat will boost and maintain your blood sugar levels. Chances are you will then eat less when faced with the football food buffet. When you skip a meal (a common ploy of people who know they are going to “pig out” later), your blood sugar falls and you will end up ravenous. A ravenous approach to any meal will undoubtedly end in a binge. Alcohol can impair your judgement, leading you to eat more than you need and more than you probably would if you were not drinking. In addition, alcoholic beverages can add hundreds of calories, depending on your intake. Follow the heart-healthy recommendation of one or two drinks. Munch on cut vegetables dipped in guacamole or salsa for starters. Avoid greasy chips, crackers, fries and onion rings. Tackle green salads drizzled (not drowned) in dressings. Catch flavor with a sprinkle of cheese and fresh cracked black pepper. Be on the defensive for soggy coleslaws, cold pastas or potato salads. For heartier selections, run to the grill or broiler for lean meats. Drop the high-fat sausages, hotdogs, and greasy burgers. If opting for carbohydrate-rich dishes, such as pasta, pilafs, or garlic bread, enjoy a serving — not four or five. Desserts can pose another diet pitfall. Instead of charging to the table of sweets, assess your true hunger, then decide if a dessert is in order. If a dessert fits in your game plan, eat one and eat it slowly. Haphazard gorging is a surefire way to lose the healthy eating game. Always eating with a health conscience is not an easy feat. If you do decide to splurge and eat more calories than normal, enjoy the calories. Do not eat seconds and thirds and vehemently berate yourself while noshing them. Take pride in having the ability to make choices and make the choice to take pleasure in your game day fare and work out a little longer for the next week. Balance is key to genuine health!